Following a seminar and a selection process, five students joined the media team for the recent 2018 ITTF Challenge Seamaster Nigeria Open which concluded in Lagos on Sunday 12th August. All were undergraduates from three of Nigeria’s prestigious higher institutions, the University of Lagos (UNILAG), the Obafemi Awolowo University (OAU) and Lagos State University (LASU). Most certainly, for every member of the group, it was a unique experience and one never to be forgotten. Shehu Idris from the University of Lagos set the tone. “It was a swell time and an experience that beats money. It was an eye opener and a learning curve for a student journalist like me to witness and participate in the field away from the comfort zone from behind a computer inside my room. Until ITTF granted me this priceless experience, I knew nothing about the rudiments of interviews but after five days of working and bonding with media veterans I improved significantly in that particular angle. It was one of the most eventful and productive five days of my life. I got to interview a lot of top class table tennis players and skilfully draft news stories that would be used in the daily newsletters. I was also given the esteemed privilege to have a by-line on the webpage of International Table Tennis Federation, a feat that brought happy tears. I also learned greatly how to handle the pressure that the urgency of social media brings. The only female in team was Adebisi Sulaimon, likewise she was enamoured. “My five day internship at the 2018 Seamaster ITTF Challenge Nigeria Open was a great opportunity; it exposed me to the use of media tools and social media platforms like Facebook, Instagram and Twitter. For example, I opened new Instagram and Facebook pages purposely for this event; it earned me a lot of followers. Apart from the use of social media platforms effectively, another area which I learned was the act of interviewing athletes. From the interviews conducted, I learned how to bring out quotes and to develop news stories for the daily newsletter. In addition, photography has now become an interesting aspect for me, I got to understand clearly the notion that a picture is worth a thousand words. For example; when an athlete’s picture is taken during a match, the picture conveys the message behind the image even without a caption. 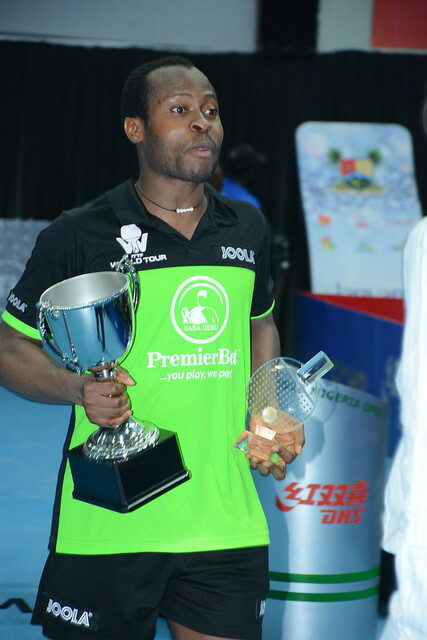 “The 2018 ITTF Challenge Seamaster Nigeria Open was the best experience I have had in the last decade, I wish I was still in secondary or primary school where you would be asked to write the best experience of your life, without a second thought this is what I would have chosen to write about. I have never been around such big players in the world of a table tennis, this five days was an amazing part of my life. I never knew until now that table tennis was so interesting and emotional. I saw people being emotional when there player lost a game and I saw myself in such a situation. I couldn’t believe myself, before now I had only thought it was only football that drives fans, supporters this emotional. Positive it was the same from Olatosimi Fadahunsi who was also selected for the 2017 edition. “Leaving the horizon of the classrooms to get not just an experience but working with the Nigeria Open media team is one in a million, it afforded me the opportunity to meet new people. It gave me the platform to display my writing skills. Having won the internship slots for two years in a row, my confidence level as an up and coming journalist has witnessed a massive improvement. From the way, I asked interview questions, to how I carried myself during interviews and how to draft my questions, have all improved, massive improvement. Furthermore, I learned when and when not to interview sportsmen. This is of great help in my daily activities with human beings. Also, the internship afforded me the opportunity to meet people from different countries and continents. Furthermore, I was privileged to meet and work alongside some top media professionals. Some of these media professionals were of help in discharging some of my duties as a media intern. They also gave advice on what it takes to succeed in the media industry. Likewise Isaacc Obinyan from the Obafemi Awolowo University was delighted. “I see this as a platform to learn the ropes on what media truly is, how it operates and how it can be a better utilized by young minds like myself. I see this as a platform to get equipped and in the long run impact others in possible ways. Thank you ITTF Nigeria Open, my expectations were met beyond my imagination. From the first day of the training, the orientation seminar enlightened us on the ropes of the media world. Teaching us on how to be an influencer, to be financially independent, how to effectively utilize our online space in several ways, using the internet and its tools. During the tournament, I received challenges which in turn made me stronger and smarter. The first day for instance, I started an article but did not complete it. Seeing the publication of the articles of my peers, I was challenged to complete mine. Unfortunately, it was not published. I focused on my digital strength and fortunately several of my works were posted on the ITTF Nigeria Open pages and platforms online. Beyond all, the ITTF Seamaster Nigeria Open gave the necessary exposure, knowledge and confidence we needed for the media world.” Isaac Obinyan (OAU).